Sunrise is the best way to start your day with healthy energy! This energy drink provides a natural boost with only the safest herbal ingredients. Formulated without artificial sweeteners, colors or preservatives, the nutrients in Sunrise are easily absorbed and processed by the body. 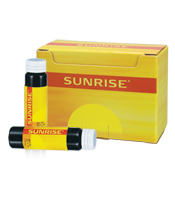 With Sunrise, perform better and recover faster! 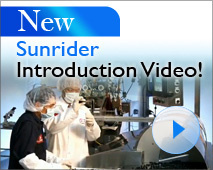 Since Sunrise is concentrated with a formula by our exclsuive manufacturer, Sunrider, there are no comparable healthy herbal energy drinks at other health food stores. Drink a vial of Sunrise and feel an energy boost for hours! Whether you're a professional athlete or a weekend warrior, you'll appreciate the support Sunrise Herbal Energy Drink gives you. 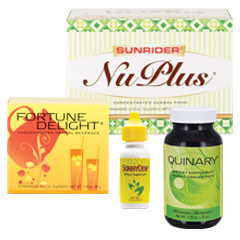 The herbal ingredients in Sunrise are harvested while their active components are at their peak.This assures effectiveness and allows for best use of the nutrients by the body. Recommendation: Consume One 15mL bottle of Sunrise daily. Proprietary Blend: Lycil fruit, lewek seed, boschniaakia herb, Chinese ginseng root, euconmia bark, mongoliavine fruit (citrus wilsonii), white cornel fruit, cnidium seed, mushroom lemon fruit extract.